So far, it's been a hot summer and a short summer. And that's to say summer hasn't officially yet begun. As manic as winter had been, summer crept around the Twin Cities like a lurking radioactive monster. From windy to above average hot, that was only after the tornado season began in north Minneapolis. One can imagine how fun it is to be a siren enthusiast. Oh yes! 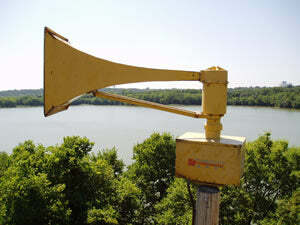 There is such an internet culture that posts homemade videos of rotating civil defense sirens for those who seek. A huge variety of people across the globe are into it. Truly they make up a fraction of homebrewers' ranks, but I'll say that the first Wednesday of the month or possibly a storm-laden afternoon summons my hobbyist ambitions as first-wort hopping would. My spare time fascinations led me to envision drinking an IPA with the wailing taste of the iconic yellow-orange Thunderbolt siren. To me, the contrast of bittering & aromatic uses of Simcoe lay one & the same with the ominously beckoning tone of those long-necked, square-horned sirens of the 1950's. Like a Thunderbolt with a bad air compressor, the supply of Simcoe hadn't weathered the winter well. Though the hop only occupies two additions in the recipe, the valid consensus among fellow brewers remains that no hop can replicate the resiny-piney-grapefruity-ness of Simcoe. So would I bow to the supply scenario & put away the recipe like so many cities across America have done away with their old supercharged sirens? Would I favor a cheaper recipe that 'does the job' in the same way Thunderbolts have been replaced with new sirens that are little more than giant electronic speakers? No, my friends... I am rebuilding the recipe with new parts to give this wailing barley beast continued year-round life! Lucky for me, one of the homebrew clubs of which I'm a member hosted a single-hop pale ale tasting comparison this past winter & Simcoe was featured. My notes recalled resinous pine flavor riding a wave of orange flavored bitterness. Grapefruit zest was well-represented too. Other dried fruit flavors were in the Simcoe cocktail too. These club notes were very helpful, much easier to reference than the countless other pales, homebrewed & commercial which featured 'Sims (why else would it have gone scarce?). In a definitely unscientific way, I judged the proportions of Sim's various flavors as they might be extracted from other hop varieties that share those characteristics. This experiment leaves out variables such as cohumulone rates, beta acids, and pays only lip service to the non-Sim flavors present in the replacement hops. Truly, it's not perfect. I have only my existing experience using these hops to guide me. The product of this pursuit will shape the next trial recipe for my beloved pale. All the while, the real subject of comparison remains how my ear tells my mouth how a siren would taste if it were a beer. I'm exposing this experiment for advice & maybe some encouragement; either from homebrew hop blend scientists or possibly others that don't heed a siren's call but bask in it as if it could be held in a glass. Tasting notes to come. Please give input, advice or just plain banter! Mash @ 151 F. for 60 min. Sparge to collect 7 gal. 0.75 oz. Summit @ 60 min. 1 oz. Mt. Hood @ 20 min. 1 oz. Centennial @ 20 min. 2L starter Y1056, ferment 2 weeks primary @ 68 F.